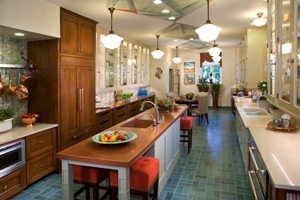 “Green” renovations, like the one shown above, repurpose original materials and incorporate new eco-friendly materials. This is the same magazine currently on newsstands for $6.99. Now, with the click of a button, you can see the newest home lighting products and get great ideas for putting your home in the best light. It’s quick, easy and compliments of the ALA.
Do you have lighting questions? Visit a Hortons Home Lighting store to talk with a professional lighting designer. Hortons is an ALA-member with professionally trained lighting specialists to help you create your perfect space. You might be one of four lucky winners to receive a lighting makeover by a Certified Lighting Designer. Enter by Sept. 30, 2010. All prizes will be awarded as lighting packages that include product and design services. Make your guests green with envy by going “green” the right way. Imaginative makeovers salvage and repurpose as much of the original materials as possible and effectively blend those existing materials with new eco-friendly products. In addition to utilizing energy-efficient appliances and lights, many remodeling projects now incorporate innovative materials, such as cabinetry made with FSC-certified* wood; low- or no-VOC* paints and wood stains; sustainable copper metal accents; water-saving faucets; and concrete counter tops. By striping and cleaning existing pantry cabinets, tile flooring and hardware, many original components are often salvageable. Restoring and repurposing materials can save energy, money and resources, and in many cases, help retain the original ambiance of older structures.